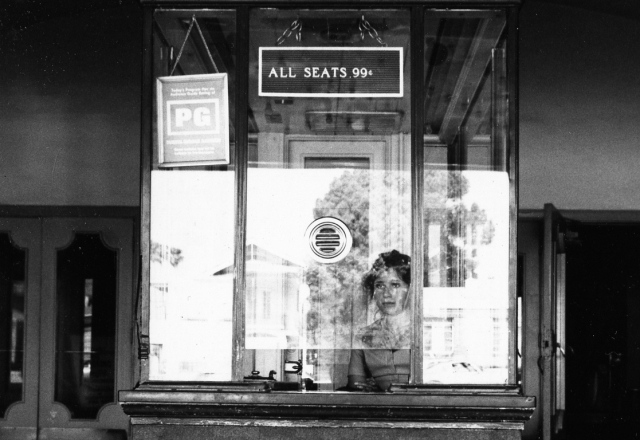 Joseph Bellows Gallery is pleased to announce its upcoming exhibition, Bijou: Photographs of Theater Box Offices by Ave Pildas. This solo exhibition will be the artist’s first at the gallery. The exhibition will open on September 5th and continue through October 24th, 2015. A reception for the artist will be held on Saturday, September 5th, from 6 – 8 pm. Bijou will feature Pildas’ small-scale vintage black and white photographs from the mid 1970’s. These images document, as the exhibition’s title implies, the small jewel like structures that crown the façade of their theaters. Pildas’ frontal camera position and distance to his subject remain the same in each image. This methodology forms a visual inventory of varied theater box offices; a typology that surveys the remaining traces of a vanishing architectural and cinematic culture. Ave Pildas’ photographs are in the collections of the Museum of Modern Art, Milwaukee Art Museum, New York Public Library, Bibliotheca National, and the Center for Creative Photography, among others. Books by Pildas include: Art Deco Los Angeles (Harper and Row, 1980) and Movie Palaces (Crown Press, 1982 and reissued by Hennessy and Ingalls in 2000). To request further information or high resolution images please contact Joseph Bellows Gallery at info@josephbellows.com. Established in 1998, Joseph Bellows Gallery features rotating exhibitions of both historic and contemporary photography, with a special interest in American work from the 20th Century.